2/3 der Länge des Querelementes beträgt. 1/7 der Länge des Querelementes beträgt. Stützen (2 , 3 ) an den Enden des Ausgleichshebels mit der Möglichkeit der Neigung in Fahrrichtung angebracht. Vorrichtung nach Anspruch 1 oder 4, dadurch gekennzeichnet, daß die Stützen (2 , 3 ) geneigt zum Sattel ausgeführt sind. The invention refers to the design of a transport vehicle seat, preferably to the seat of a bicycle. 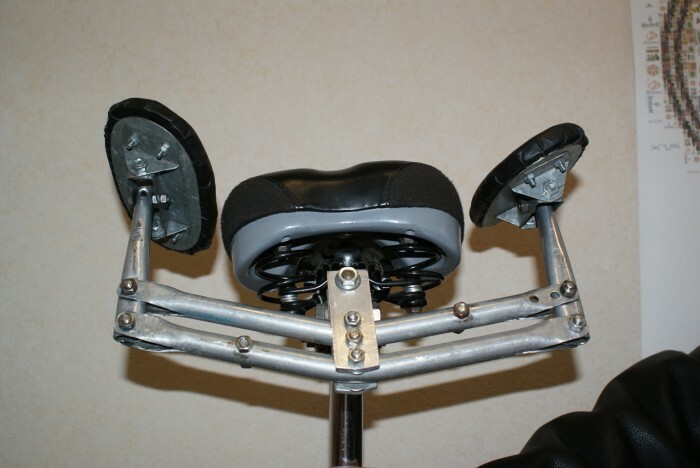 The invention can also be used for exercycles. 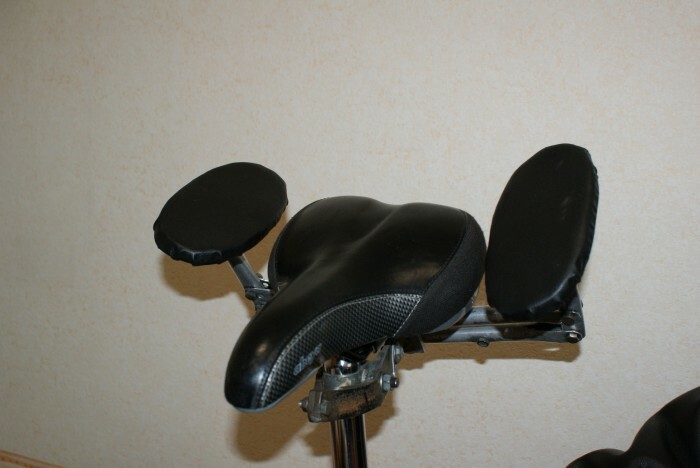 The objective of the invention is to provide a bicycle or exercycle seat that allows increasing the contact area of the cyclist's body with the seat with simultaneous decrease of the pressure in contact points, as a result of which higher comfort of riding and better stability of the cyclist's body in motion are achieved. 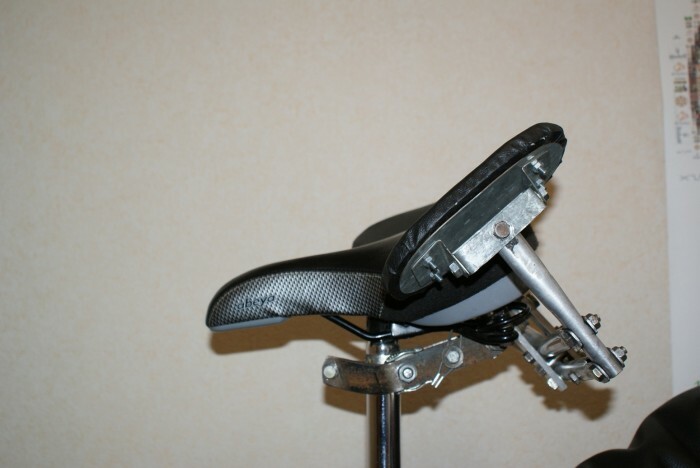 The objective is attained by means of the bicycle (exercycle) seat, which comprises a bicycle (exercycle) saddle clamped to the saddle tube and a supporting device in the form of two supports symmetrical relative to the saddle and movably linked together; the device is additionally clamped to the saddle tube of the bicycle (exercycle). Another aspect of the invention aimed to attain the objective is a device further installed to the bicycle (exercycle) by means of clamping it to the saddle tube and made in the form of two supports symmetrical relative to the saddle, linked together by: 1) a four-element yoke, which comprises two transverse rigid elements of equal length linked together in their central sections, and two vertical rigid elements of equal length, movably mounted to the ends of said transverse elements with simultaneous synchronous vertical displacement; the yoke has at its central section a device for attaching to the saddle tube of a bicycle, or 2) a single-element yoke, and the supports are attached to the ends of the yoke with a possibility of being inclined along the travel. A bicycle and an exercycle equipped with the seat according to the present invention are also the objects thereof. Page created at 2019-04-26 5:56:29, Patent Auction Time.